Inspired by the Zipper logic and knot diagrams post, here is an alternate encoding of chemlambda. This is part of the series on zipper logic (branded in this post as “zipperlogic”). The last post is Zipper logic (VI) latest version, detailed. As can be seen in that post, zipperlogic is equivalent with chemlambda, but it has two interesting qualities: is more intuitive and it has the CLICK move. The CLICK move transforms a pair of opposed half-zippers into a zipper, which is then unzipped with the ZIP move. While the ZIP move is equivalent with the graphic beta move, there is no correspondent to the CLICK move, apparently. The CLICK move becomes useful when we use other realizations of the zipperlogic than chemlambda. 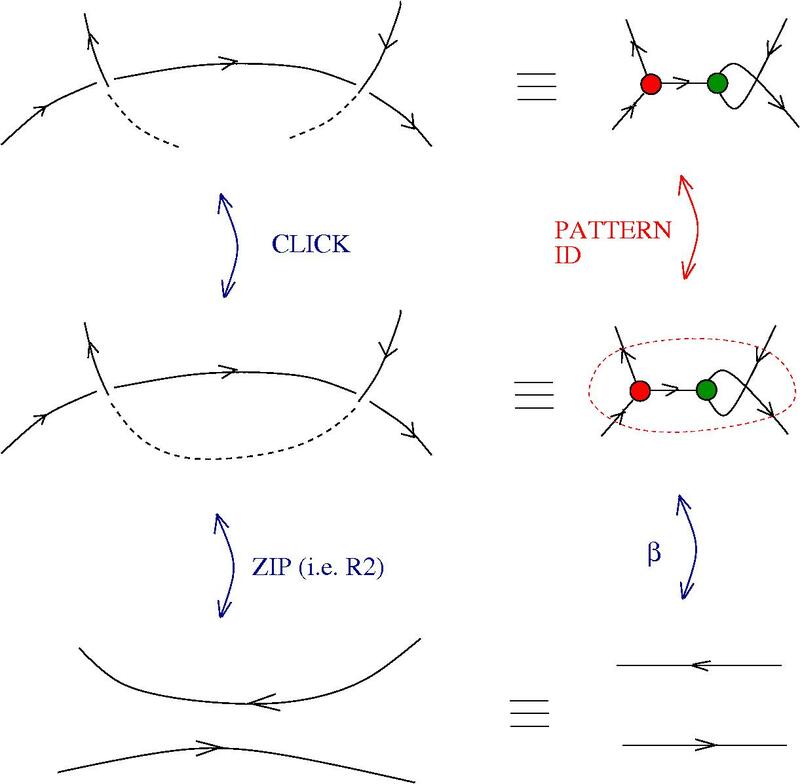 In the one where half-zippers are realized as towers of crossings, the CLICK move turns out to be a pattern recognition move, and the ZIP move becomes the familiar R2 (Reidemeister 2) move, applied to that pattern. That is why CLICK is interesting: because in order to apply moves in chemlambda, we have first to identify the patterns where these moves may be used. Now, I want to justify this in the following. I shall not aim for another realization of zipperlogic, but for one of chemlambda, inspired by the one of zipperlogic seen as acting on towers of crossings. So this post can be seen as a try to answer this question. But the halfcrossings which I use here are different than the ones defined by Louis Kauffman. There might be a way to transform ones into the others, but I have not found it yet. Remark that each of the halfcrossings has a dangling, vanishing thread, like in the previous post Bacterial conjugation is beta reduction. 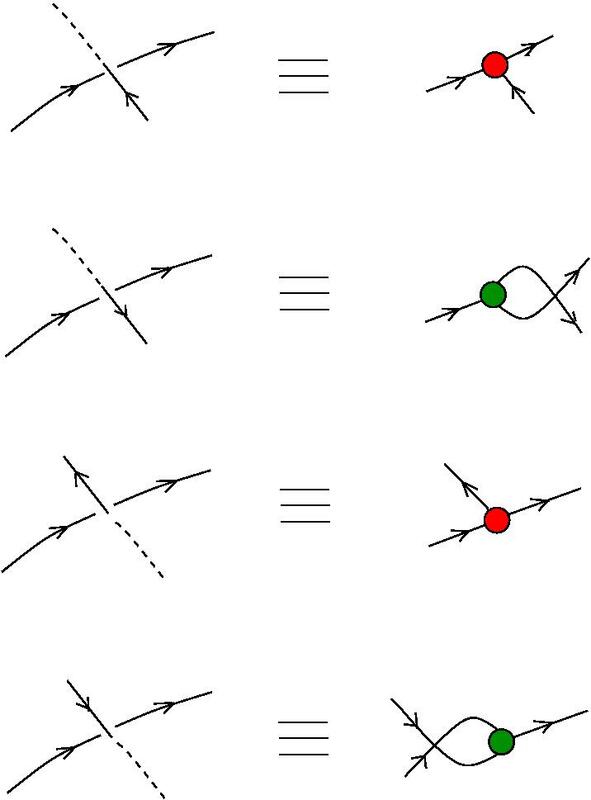 Look at this as a new notation for chemlambda nodes and just replace the green and red nodes by these halfcrossings in order to get the right moves for the halfcrossings. With an exception: the CLICK move. This move consists into joining neighbouring dangling threads, in two situations, one related to the beta move, the other related to the FAN-IN move. 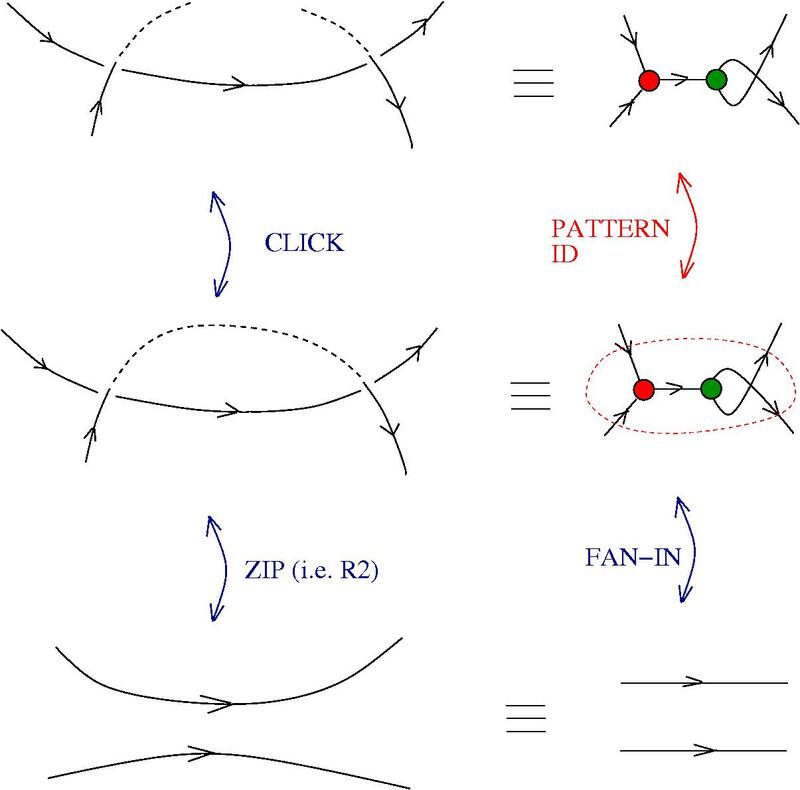 Now, the other CLICK move, involved into the identification of the pattern appearing in the FAN-IN move. In a future post I shall look at the DIST moves, in this encoding.